Orange roughy (above top): Fished since the 1970s, stocks in north Atlantic and Pacific have fallen by 75 percent. Blue ling: In the north Atlantic, trawlers are hunting down surviving blue ling populations. Prickly shark: Rarely eaten, this slow species is trawled up in the Pacific then thrown away, dead. Roundhouse grenadier: Can live to 70 or more, and form large Atlantic shoals 900m deep. Over-fished. The deep ocean is one of the world's last great wildernesses. But not for long. Two kilometres below the surface, scores of rare and exotic species are being wiped out at a dramatic rate. These unique species include the goblin shark which boasts a unicorn-like horn, prickly sharks with humped backs and glowing eyes, vast single-celled organisms as large as footballs and tripod fish that stand on their fins. In a letter passed to The Independent on Sunday, Britain's leading marine scientists have warned these species face extinction because of the global growth in deep-sea trawlers fishing for edible species such as the orange roughy, hoki and round-nosed grenadier. The damage is indiscriminate, they warned. The vast nets, which can reach down for 2km, pull up thousands of tonnes of fish each year, but most are thrown back into the sea, dead. Held down by rows of steel rollers weighing up to 200kg each, those nets are meanwhile devastating the ancient coral beds and sea mounts which are the home to the deep sea's marine life by scraping the sea bed clean. 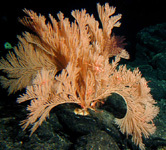 Some corals, such as the seafan, can be 1,000 years old. Other sea bed species being destroyed include fields of glass sponges with skeletons like fibreglass wool, and flytrap anemones that close their tentacled mouths around their prey like a Venus flytrap. Last week, more than 50 of Britain's leading marine scientists and ecologists, including the president of the Royal Society, Lord May, have urged the Government to call for a global ban on the industry at the UN. Their unprecedented demand follows worrying evidence that the deep sea is being "irreparably destroyed" by the industry. The UK, they said, should also use its presidency of the European Union to persuade the rest of the EU to support its moves for a worldwide moratorium. Crynoids (above) are one of nature's phenomenoms. It is a deepsea animal with fron-like arms that move to catch food flowing in the ocean current. 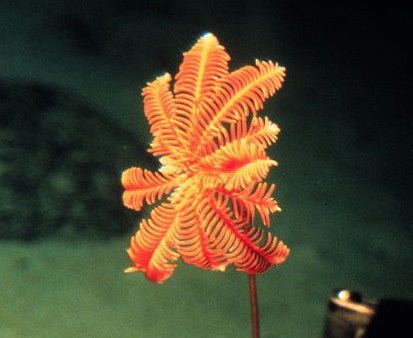 The arms of this plant-like creature are attached to a narrow straight trunk, with feet that allow it to move about the seafloor. The scientists' greatest fear, said Professor Callum Roberts, a leading government adviser on marine conservation, is that the damage could be permanent. Even if deep-sea trawling were banned now, it would take decades to recover. Professor Roberts, from York University, said many of these species have very long lifecycles and rarely reproduce, which means that a major trawling expedition can wipe out an entire generation of deep sea fish in that area. Some rockfish species can live to 200 years old, while orange roughy live to 150. "The pace of life is glacial in the deep sea, so we simply can't extract very much life at any one time," said Professor Roberts. "A sustainable rate of removal is 1 to 2 per cent in any one year, but trawlers fish at a far higher rate than that. It means that they extract everything they find." Copyright © Independent News & Media. This article was first published in The Independent 16/10/05. Copyright © 2005 TerraNature Trust. All rights reserved.